majorly famous (and handsome) yet the most down-to-earth celebrity I’ve seen in interviews. chose the film, but that probably won’t happen so I’ll just go with why I like it. For starters, Damon’s performance as New York politician David Norris definitely has my vote. Men and Anthony Mackie from The Hurt Locker. alert if either of those will prompt something that’s not meant to be. to listen to The Movie Maven’s report on The Current every Friday morning. the Matt Damon obsession), but my decision was affirmed by Ms. Maven. was for newbies to the sci-fi genre to check this one out. humor and a very solid cast. 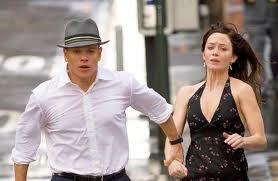 in their relationship with The Adjustment Bureau guys pulling the strings. It’s all about plans and fate, so trust me, everyone is meant to see this one. James Franco has been on my radar of late and with my mission to see all 10 Oscar nominees for 2010 I got to witness one of his latest projects, 127 Hours. It was the only one I didn’t get to see before the big show, but I now know why the film made it to the big leagues. Several of the best pictures were based on true stories, which is one of the reasons I appreciated 127 Hours. Director Danny Boyle took the story of hiker Aron Ralston falling into a canyon and being pinned by a boulder and presented an engaging visual depiction of a seemingly simple tale. I didn’t think about it before watching, but what could possibly be visually interesting about a guy trapped for five days? Ralston wrote a book about what happened, which I haven’t read, but I can understand how on the page his story could be compelling. Boyle and the film’s writers, luckily, consulted with Ralston and watched tapes he made while trapped and turned out a work that is probably equally has compelling as the book. I guess it depends on your preference of medium which version of the story you’d like. There is the film, book, and of course the media frenzy about Ralston after his accident. But, the film as far as I can tell didn’t stray from what actually happened and paid respect to the plight of someone who lived through such a harrowing experience. Audiences shouldn’t be disappointed in choosing that version. Boyle melds a one-on-one struggle a man must face trying to survive with reflection of his time on Earth since he realizes he might die. Other than meeting two hikers early on his hiking trip, Franco as Ralston is all by himself and has to act alone for a majority of the picture. I knew going into it that ultimately Ralston cut off the arm pinned by the boulder in order to climb out the canyon and have even a chance of survival. The journey starts with Ralston trying to get out from under the boulder, thinking of times with his family and friends, and ends with a grisly scene that shows the viewer as much as possible what it looks like and feels like to cut off your arm. It was incredibly graphic and not for the squeamish, but the scene couldn’t and shouldn’t have been done any other way. Franco gets props too because, other than the visual scenery and music Boyle crafted, 127 Hours was a one man show. He was what viewers saw most of the time and had to be entertaining while focusing on pretending to live through someone else’s life-threatening experience. Back to 127 Hours’ roots in Ralston’s story, a film about such an accident and struggle would not have been at all believable if someone just came up with the idea as fiction one day and put it on screen. Even with the same cast and cinematography, the film as fiction would have lost me right away. But, Ralston decided to tell his story and leave it to creative minds to take it to the next level. From all sides, 127 Hours holds its own with having a tale that’s as heartbreaking as it is heartwarming to work from. What’s not to give away is who Ralston is as a person shown by Franco during his five days in the canyon. We all know he cuts off his arm to be free, but not why he wanted to be free and the life he’d lived before the accident. It’s one of those “I was lost and now I’m found” type of scenarios and the film really just took me away on the journey with Ralston. Boyle redeemed himself from Slumdog Millionaire for me, and here’s a guarantee I’ll be catching up on what I haven’t seen from Franco and his next projects. It’s been a tough decision, but I’ve decided to let my Netflix queue run free and not add to or reorder it until I get through more of the titles. (I of course have a separate running list for when that happens). At least I know there is some Franco work in there somewhere, and I hope it comes up sooner rather than later. O Gnomeo, Gnomeo, wherefore art thou Gnomeo? 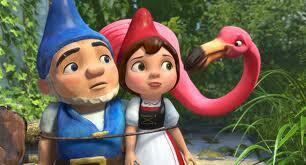 That’s right, I was able to check out Gnomeo and Juliet in 3D this weekend. I have never been one for garden gnomes, granted I do not have a yard, but where can you go wrong by interjecting them into an animated flick set against the classic William Shakespeare story? Gnomeo and Juliet has the typical animated fare of late including a romance, cheesy puns, a sidekick for each main character, and a happy ending leaving viewers all smiles. Plus, it had Elton John music and an animated cameo of the sparkly gap-toothed singer. I guess he’s been working up to this since The Lion King. The visual features were appealing enough, but I don’t have much to compare them to as far as similar films I’ve seen in the last year. Alice in Wonderland was better as far as 3D and Toy Story 3 was more refined in what made it on screen. Frankly, I don’t think the editors did much when Gnomeo was on the cutting room floor. There were some pretty random scenes, such as when Juliet’s frog sidekick character was shown covered in rose pedals like in the movie American Beauty. Huh? Was seeing a scantly-clad gnome trot through the garden in a skimpy thong bathing suit necessary? I don’t think so. But, I appreciated some of its humor and the heartwarming take on Romeo and Juliet. Both kids and adults will enjoy the movie enough, but I think it’s safe to save for viewing at home. Adults, I suggest a double feature of a sad movie or something hard to watch like 127 Hours (which I just got back from at the theater) and then taking in Gnomeo to cheer you up. Sigh, the Oscars are over. What am I going to look forward to now? Well, the 2012 show of course and finding out what movies will end up being nominated. Until then, I have time to see those on this year’s nominee list that I missed before Feb. 27. Last night was probably the first Academy Awards broadcast I made a point to watch from start to finish in a while. James Franco was appealing to me as a host but Anne Hathaway, not so much. She was a little too “Oh – my – ga, I am totally hosting the Oscars right now. No way!” But they pulled it off together and James Franco’s slight improv (see the “Go Nerds” line) was to my delight. Other than that and the final scene with the student choir and all the winners, the entertainment value of the show wasn’t all that much. After writing my predictions for the awards earlier this year, I realized the predictability of the winners — though very deserving — kind of ruins it when it comes to the big night. As far as the top award categories, I’d say each of the selections was a shoe-in, and of course I’m glad The Social Network didn’t win the big prize. I saw an interview with a critic before the show started, and he said the favor switched between The Social Network and The King’s Speech in the last six weeks. I already knew that, but it was interesting that he said it switched back to The Social Network most recently and that viewers should not be surprised if it won. I guess he was wrong on that one. Though Tom Hooper’s work for The King’s Speech was very accomplished and worthy of the award, I have to say it would be nice to have an Oscar moment for the best picture when a curve ball comes in and a very unsuspecting cast and crew is called to the stage. Be it those from The Fighter, True Grit or Black Swan, that really would have stolen the show. But, it is what it is and I thought when it got to the acting categories that both Colin Firth and Natalie Portman’s acceptance speeches were eloquent and true. Had Colin Firth made a spectacle and actually danced, it would have taken away from how he described the true effect of winning the Oscar. Portman may have been speaking just as the words of who to thank came to her, but it didn’t come off that way. Melissa Leo’s speech for supporting actress in The Fighter of course is being talked about since she let out a word that had to be “bleeped.” But her true surprise reminds the audience that while the selected movie stars may be predictable winners to those on the outside, it’s not the case for each nominee. To round out my favorite speeches, Randy Newman’s words were well played and the sudden emotion of Christian Bale brought out the human being from behind all the lights, glitz and glamour. So, which titles on my ballot will I still choose to see? 127 Hours will round out the best picture category, luckily it is out on DVD this week to make up for my thwarted plans to see it in the theater. I don’t know anything about Animal Kingdom, but was intrigued by the clip showing Jacki Weaver’s performance and I also need to catch Javier Bardem’s Biutiful. Both the other animated features, How To Train Your Dragon and The Illusionist will probably make their way onto my Netflix queue, and finally if I had to pick one more (which is tough) it will be Exit Through the Gift Shop. I’d of course like to see all the documentaries and foreign films, but those would be my top pics. I haven’t seen any Oscar material yet this year, but it’s still early. And, based on the fact that half the best picture nominees came out very close to the actual 2011 award show means the contenders for next likely won’t be on the table until the seasons cycle through the warm months and back to winter. So, now less than 24 hours after the big show ended, my anticipation has returned. I’ll be at the movie theater if anybody needs me.